Do you need to calculate multiple conditions in a formula? 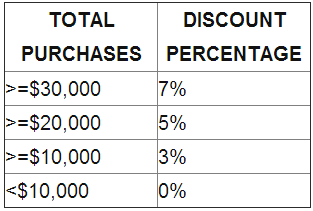 Similar to the example below where a specific trade discount percentage has been used depending on the quantity purchased? If that is the case then you can use the Nested IF statement. The Nested IF statement enables one to calculate multiple conditions in a formula. As a result more elaborate tests of data can be constructed. The If statement can be used to conduct conditional tests on values and formulas. However if more elaborate testing of data will be carried out then the Nested If Statement can be used. Tada! You are now an Excel genius!